Hello all and welcome to the mod Blockacy of Kain (formerly LoK : Soul Reaver). This mod attempts to bring the franchise "Legacy of Kain" to the Minecraft World, I will hopefully be adding several things from all the games in the franchise, from Blood Omen, to Soul Reaver and then Defiance, I'm going to ignore "Nosgoth" as it's not from the same era of gaming (and hard to slot into same canon). Been a long time since I've done anything here. It's early for this but my New Years resolution is to try harder in everything I do and as such I'll be putting time aside each work to mod Minecraft. So I'll be working on this mod again and keeping the thread updated as I go along. It isn't the only mod I'll be working on so it's not going to be constant updates. I hope if you follow me you keep up, and at least check in once a month (I'll be doing an update post to say what I've been working on instead of dead silence all the time). The following should be a helpful guide to what's included in the mod. In this mod, there are currently 3 mobs, these are temporary and are only there to add a way to get the drops to craft items without having to affect anything else in the game. Water burns like acid to them and they can infect others to become one of them, not to mention they come in a variety of sizes. There are 3 items dropped by the mobs that are used for crafting. These should be temporary, and removed along with the mobs once a better system is thought up and added in. No special effects with those, purely for crafting. The Soul Reaver, IS the iconic weapon of this series, and therefore should be the main focus of this mod, at least in terms of the weapons. The Spectral and Elemental Reaver's can be swapped so long as you have one of the Elemental Basin's nearby. The blades don't have a durability but that's just because the blade should be a blade of immense power and as such shouldn't be able to break. (Forget the crypt in SR2). Right-clicking actives the powers and Sneak Right-click will revert to Spectral Reaver. Fire Reaver - Sets things on fire when hit, also acts like Flint and Steel, light's the Fire Sconce. Water Reaver - Freezes moving water, extinguishes the Fire Sconce. Earth Reaver - Spawns dirt blocks. Air Reaver - Knocks mobs backwards. Light Reaver - Blinds close-by mobs, can light the Dark Orb. Dark Reaver - Makes you invisible, can darken the Light Orb. Spirit Reaver - Acts like a bucket of milk. Note : They aren't anywhere near done as I plan to add more powers to some that further match the game(s), and possibly create 3D models for them and add in a better system overall for them. Also, new weapons eventually that match the games that Raziel can pick up. Quite a few blocks in the mod at this point, possibly lots more to be added yet. In future there will be other types of purely decorative blocks and then actual useful blocks too. Although some blocks in currently are for decoration they may gain a use in future after stressful planning and wondering how and what. Pillar Blocks - Just Decoration. Elemental Basins - Right clicking swaps between different Elemental Reavers. Light / Dark Orb - Creates a light value depending on the type. Fire Sconce - Creates light if it is lit. Changed with Fire / Water Reaver. Screenshots to come ! Please submit some? ! Elemental Door only open-able with the correct Elemental Reaver. Sarafan Warriors (Armours and Weapons). Vampires Clans (Adult and Fledglings). More Reaver powers + associated blocks. More intricate Reaver Power obtainment (Forge's). Have an idea? Would you like a certain feature be added? What thoughts do you have about the Legacy of Kain Franchise that should go into this mod. PLEASE, comment down below or even just send me a PM, I am open to any and all messages that could possibly make this better than I want. Credit will be given if it is included and you thought of it first. I have no idea where I am in the current modding process and as such I cannot say what will be in the next update, once I have an idea I'll post about it and let you all know the "roadmap" of sorts. I'm thinking start small with a few items and such to give a bit more content to the mod and then work on bigger things. When attempting to obtain Elemental Reaver, it swaps for ones already in inventory instead of creating new ones. Pillars can't be "Middle clicked" when in creative to obtain them. Ice waterfall has no bounding box so it can be climbable on the wall behind. Some Reaver powers might not actually work. Some Textures are bad, I know, but that's because I'm not much of a Texturer, I can however model really well and then animate those models. All criticism is welcome as this is my first mod (coded myself) and I would like to know where I could improve. If you're interested in other thing's I've done, I've also released a Jak and Daxter mod "Precursor Blockacy". Just updated the mod, and things to look out for are the Light and Dark Orbs, these produce a light level. Light gives off 15, Dark gives off about 8. The Light and Dark reaver can affect which block these are, for instance, right clicking the dark orb with the light reaver will make it a Light Orb and vice versa. Fire Reaver has an ability, sets entities on fire when struck, and can also act like Flint and Steel, settin objects on fire. Vampire teeth are now a more common drop from vampires. Take note these mobs will be replaced in future and the vampire teeth removed unless requested to stay. Post back any ideas anyone has for this mod, I have a few of my own to do however I welcome input. I have managed to make one of the special abilities work the way i want it to. And they have cool-downs now so they won't be over powered. I still need to add config options for several things so you all have a choice of stuff. Not sure on some abilities for some Reavers so any feedback from you lot would help. Some blocks, items and entities still need adding but they wont take long to add in. If anyone has any Ideas for this mod, they too are welcome, and any mod reviews or spotlights are too, I only ask that you post a link to this page if you do. No date on a possible updated release yet but not far now. There may be several bugs that will need ironing out however I can't possibly test for all of the as some may be SMP and I can't test for those so after the release I welcome all crash reports or bugs that are found. Well that's nice of you, however as far as item textures go, you can re-texture whatever is in the current release. You can re-texture the mobs too if you want, however I feel this might be a wasted effort as I have planned to remove all 3 current mobs and replace them with the vampire clans from Soul Reaver 1. Any other items from the franchise, texture away and I'll see what I can get in/done. xD Thanks for replying though and offering help. Well and what about helping to make the new textures, the staves, and some buildings for make it more like the Soul Reaver "places"??? Make textures for the weapons that can be found by Raziel in Soul Reaver. If you feel so incilned, make textures for weapons and such in the other games too. If you think of anything else that could be included as part of the mod, just post it and then start work on it yourself? As for buildings, make some, it would definitely save me time later when I start on them. I guess that you could start with the pillars of Nosgoth... make the blood omen era pillars or the soul reaver era pillars, ones decayed, ones pure, ones with Kains throne. Your choice. I have no plans for any buildings for a while, I want to have the next installment of this mod be focused on the vampire clans of the soul reaver era and then after that move onto a dimension. I've got a little idea on how to do that but code wise no clue what to do. The staves will be handy regardless of whether they are 100% or not, if you want, then make a 32x32 version of them and i'll research how to make the items use 32x32 textures instead of 16x16. As for souls... what do you mean? and how would I have the player interact with them? Say if only on killing something with a reaver it will release a soul which will despawn over time, no problem, the soul would then be an entity but how would It affect the player and how would the player absorb the soul, would the player need to become a wraith or something? Plan it and a method might be able to become a reality as to how they could be done. What about, if the player chooses at first (when he enter the world for 1rst time) to be a "spiritual creature" each time you kill something they will drop a soul (item or entity) wich can be used (only for them) as food, healing item, etc. Just that. Also it could be used for Add power to the one who "eats" them. Like more healt, more damange, or things like that. At least anyone who is reading this post, I've just updated the mod, mainly as a bugfix so that the mod doesn't crash when you're using the recommended Forge. 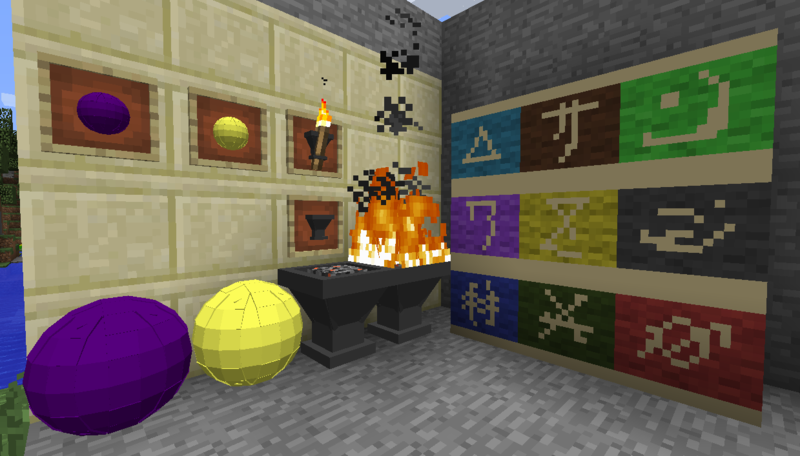 I've also added a Fire Sconce block so that there is at least a little more content. Hope you enjoy! P.S. The mod needs a new name, please if you have a good one, post it, otherwise pick one from up top. P.S.S Updates won't be common however when there are updates, I hope to make them fairly big and much better from now on, I still have many responsibilities with other mods and such, but I hope you do enjoy. Not too keen on the first one as it doesn't give off the minecraft style of naming. The second one does though, however it seems more like an expansion to a mod called "VampireCraft". Even though I personally may not like them, others might, so i'll add them to the poll now. Thanks for posting. A play on words from block as in minecraft blocks, and legacy of Kain, the franchise upon which the mod is based. Well I'm not much of a Texturer so they are bad because I'm bad. You can definitely try and retexture some of the fonts if you want, just keep the size of the texture files to the same ratio scale, I hope you know what I mean. A texture pack for what though? and I don't see why not, go ahead, but yes credit please . I have an idea in future to rescale some of the texture's and make them far more detailed, if i follow through you can use them too, but alas I am bad and it may not turn out okay, I do also plan to see how well a 3D model would look. The fonts will spawn randomly once structures are in, otherwise they might be spawned in a dimension when that's implemented (i plan for one in the future). I would think craftable could be an option or up to a vote in the future too, but I still plan to have them spawn like you think. Now to the glow of the forged reaver, that's a nice idea, it would need some more thought though as if it's on multiplayer, would it glow from the moment 1 forge is used, or only glow for the person who forged the reaver in the forge? It might get complex to only allow some people to use certain ones, the trouble I think I would have is making the Soul Reaver be limited to 1 player at a time. For the moment though I will just leave it as it is, and once the forges are done, i'll have a particle effect instead of a beacon light (too much for 1 font), but I'd like to hear of any more ideas you might have in future.